Waterproofing was an important consideration for General Contractor RJ Ryan when building this multi-tenant commercial space in the Bassett Creek area of Minneapolis, MN. 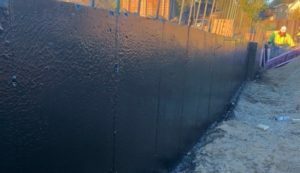 Developers found a high water table on the site and came to Kinzler Construction Services for advice on a cost-effective waterproofing solution. The experts at Kinzler recommended and installed GMX Ultra-Shield WB, a solvent-based polymer modified asphalt waterproofing membrane. We worked with the contractor to ensure this was the best option for this project’s specific application requirements and budgetary constraints. We followed our proven process for quality installation by inspecting the completed job and grading our installers on the quality of their work.